Most animals get a nail trim/pedicure every time they visit the groomers. But not all animals make it into the pet salon. Some pets bathe themselves in the pond or lake or swimming pool (you know those dogs I’m talking about), some get groomed at home and some just never seem to be dirty. But do not forget about their toenails. A good pedicure is one of the most important parts of grooming. 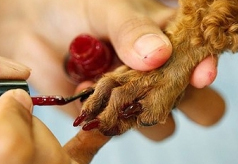 Pet’s feet and the condition of their nails are critical to their health. When their toenails are not properly maintained, they grow long and brittle. As they grow long and stay that way for an extended period of time, the quick (pink meaty part) also grows longer. When the nails are long and brittle, they tend to break and tear more easily. Long nails are easily caught on carpet or even in thick grass, leading to a very bloody torn toenail. This typically becomes an emergency that Mobile Veterinary Hospital of Tulsa has a lot of experience with. Another very important reason to keep your pets toenails short and smooth is keep their joints in tip-top shape. When their nails are long, it actually causes their toes to rotate from their natural position, which will lead to discomfort and even a shift of their weight. When this happens, their joints will suffer! Senior pets can actually suffer severely from long toenails. Senior pets’ nails tend to grow longer faster, because by nature they are exercising much less. Exercise is a natural way for them to file down their nails. Senior pets with long nails suffer from slips and fall much more frequently than you average, healthy pet. Make sure even the smallest of tasks are taken care of for you furry friend. Dr. Kristie and Holly at Mobile Veterinary Hospital of Tulsa can give your pet a pedicure or teach you how!